Numbers: It was a wet summer and the numbers were a few hundred less than in `95. The Guest Book recorded 200 visitors June 8, 9, and 15-30; July, 417; August, 601; and September 1-23, 197: for a total of 1415. The Custodians counted 1686, though undoubtedly many were missed. Most were from Ontario, 63 from other provinces. Other signers came from 21 States, 11 European countries, plus, Jamaica, Japan, China and Korea. Group visits brought two vanloads from The Towers Nursing Home in Port Hope, 3 carloads from Edith Rankin United Church’s U.C.W. Unit 4, and a group of 32 from an Elderhostel program. Three weddings were celebrated in the church, plus a Masonic service and the annual Pilgrimage Service. A Woodstock couple, returning from a summer course in Ottawa on “Revival Periods in Church History,” showed great interest in the church where some of it happened… Donald Maracle, chief of the nearby Tyendinaga Mohawk Nation dropped by… A man described as “likely in his eighties, who walked with exceptionally good posture” identified himself as a great-great-grandson of Sarah Cole, whose sister, Mary Cole, was one of the ten teens drowned in Hay Bay in 1819… Bill and Anne Squire of Ottawa made their first visit here, while researching her Loyalist roots. Anne was the first lay person to be elected Moderator of the United Church of Canada (1986-88). On June 7th, 1811, Paul and Mary Huff drew up a deed of bargain and sale, granting one and a quarter acres of the farm to seven named trustees (William Casey, Solomon Huff, Christopher German, William Moore, John Roblin, William Ruttan, and Augustus Shorts), representing the Methodists in this community. Most of the wording of the deed was taken from the sample deed contained in the Doctrines and Discipline of the Methodist Episcopal Church. No money was paid; it was given, as the document affirms, out of “the Love, Goodwill and affection we have for the Methodist Episcopal Church.” Five of the seven trustees as well as the donor had been subscribers for the original Adolphustown meeting-house in 1792. Three of the named trustees and their families are buried here along with the Huffs. Our problems arose from one single fact: that deed was NEVER REGISTERED with the municipal authorities. Was that because of negligence? or the outbreak of the War of 1812? A more realistic answer lay in the fact that the Methodist Episcopal Church was not recognized at law, was considered an imported American sect, and was not entitled to hold property in that name. Nor were Methodist ministers allowed to perform marriages at that time. The transaction was completed in the minds of the participants, but not acknowledged beyond that generation. Thus, when the old church was abandoned in 1860 in favour of the new one built a few miles away, the land could not be sold. The building, but not the one and a quarter acres, was sold for a few dollars to the farmer who then owned the land. In 1910 the Methodist Church purchased the decayed building and surrounding property on the north side of the road. They seemed unaware of a cemetery across the road, probably lost in undergrowth. 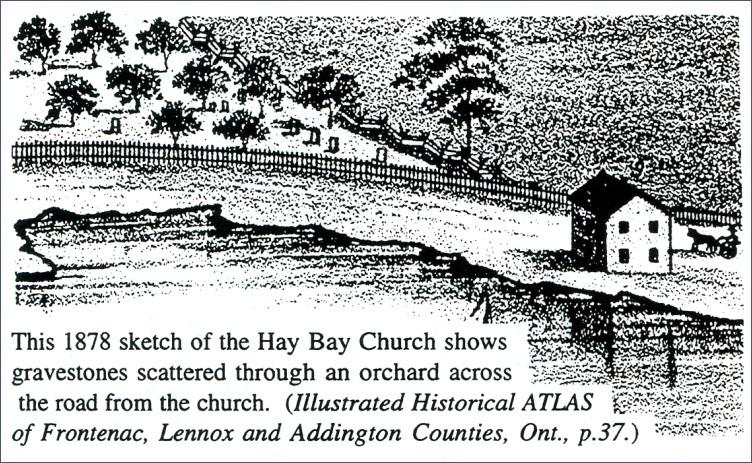 In 1961, the Ontario government, in an effort to rescue hundreds of abandoned cemeteries and make municipalities responsible for their upkeep, approached the church trustees about our graveyard. It was declared CLOSED to any further burials, and enclosed with a fence. At that time the trustees were unaware of the existence of the 1811 deed, and so a deed was drawn up for an area whose dimensions were guessed at, but which were somewhat smaller than Paul Huff had designed. In the last few years much research had been done, including an archaeological assessment in 1993. The 1811 deed came to light from its hiding place in the United Church Archives at Victoria University in Toronto. The restoration and upkeep of this hallowed edifice have always been our priority, but in the last few years we have been able to address this outstanding property matter, and the deed was finally executed and registered on February 29th, in this leap-year of our Lord one thousand nine hundred and ninety-six. The original area has been enclosed, and Jack Roblin and others have created a beautiful white picket fence along the roadside, similar to the one shown in the 1878 sketch of the cemetery which appears on the back of the Dedication Service folder. It has taken four deeds and 185 years to get the matter straightened out. Perhaps this summary would be better described (if I may use a double-entendre) as A CONFESSION OF OUR MIS-DEEDS, but at last we have obtained legal possession of all of the property which Paul and Mary Huff intended to give to the Church. This in itself is an achievement worthy of celebration. We wish to especially express our gratitude to our neighbours Gladys and Robert McIlwaine who own the old Huff farm immediately south of us, and who have been very cooperative and generous in offering the reclaimed land at no cost. Research continues to try to identify definite and possible persons buried here, as there are no burial registers or cemetery map that have survived. Of the 140 to 300 estimated interments we are able to identify only a score or so by name. Obituaries and wills sometimes give us clues, such as the 1852 will of Owen Roblin in which he stipulated that “I desire to be decently buried at the Methodist Chapel in Adolphustown.” This is probably the oldest Methodist cemetery in the province, and here lie some of our forefathers who endured the scorn, the injustice and distress heaped upon Methodism in that day, and have laid the foundations of what is now the United Church of Canada. “In the name of the Father, and of the Son, and of the Holy Spirit, I dedicate this ground to the glory of God, to be set apart from common uses, to be God’s Acre associated with this historic church, as a memorial to those who pioneered the Christian faith in this province, and as a resting-place for their earthly remains until the Day of Resurrection. The Executive of the Bay of Quinte Conference has confirmed four new members of the Trustee Board of the Hay Bay Church. These are: Rev. David Jones, minister of Pickering Village United Church, Oshawa Presbytery, on the extreme western edge of the Conference; Alvin McIlwain, farmer, of Adolphustown Township; David Sexsmith, community college teacher, of South Fredericksburgh Township (on the old Dafoe farm); and Mrs. Dale Woodside, primary school teacher, of Scarborough.